It is time to frock-up in your polka dots and Disney mouse ears, kids. Minnie Mouse is making her way to Melbourne to host a very special Polka Dot Tea Party at The Langham. Minnie jets in from Disneyland California, taking time out from her Dare to Dream tour with Disney on Ice, to host a special tea party over two days; Sunday 31 May and Monday 1 June 2015. Expect Minnie cupcakes complete with chocolate “Minnie ears,” polka dot cookies, strawberry jelly cups, tea cup macarons, Minnie cake pops, watermelon Minnie ears, bow-shaped strawberries plus lots more cute and delicious treats. There will also be a Minnie Mouse-inspired fashion parade and a nail painting station to add to the fun. The costs: a special early price of $79 per child and $84 per adult can be booked now. Adult guests can also enjoy a glass of bubbles included in the price. 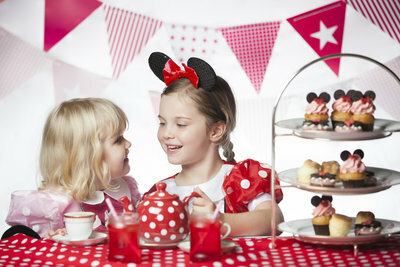 Children are encouraged to dress up in polka dots or wear a touch of red and white; Minnie’s favourite colours. Childrens high teas at The Langham fill very quickly; to book your spot, call reservations on 1800 641 107 or email rest.res(AT)langhamhotels.com as soon as possible to avoid disappointment. Do you have a favourite Baz Luhrmann movie? What is your favourite 'end of the world' movie?